For-profit colleges and federal aid: They get more than 90 percent of their funding from the government. Why for-profit colleges are the real welfare queens. 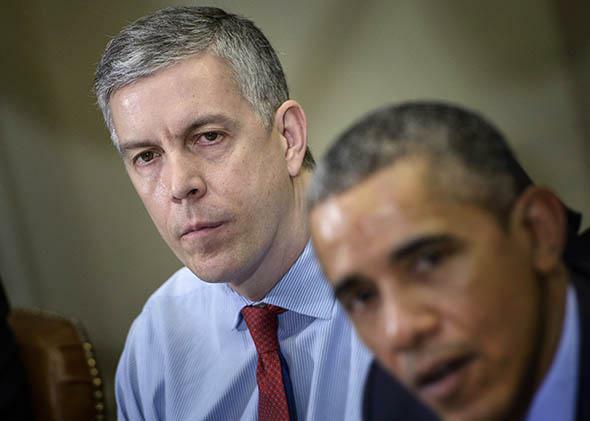 Secretary of Education Arne Duncan listens while President Obama makes a statement at the White House on March 16, 2015, in Washington. Is Corinthian Colleges’ recent bankruptcy a sign of the end times for the for-profit university industry? As the Washington Post recently put it, proprietary institutions everywhere are currently “buckling under government lawsuits, regulatory scrutiny and depressed student enrollment.” So, provided that the Obama administration makes clear that Corinthian’s victims are entitled to debt relief, will purveyors of legitimate education start to feel like we’ve been raptured up to a heaven bereft of predatory education? Maybe. Since 2014 (well, really since 2009, but more on that in a minute), the Obama administration has taken a relatively hardline stance on the least scrupulous of the for-profits. As Secretary of Education Arne Duncan told me in a recent conversation, these institutions lobby aggressively on “both sides of the aisle”; the industry has enough friends in Washington that a majority of the House of Representatives voted to block regulations that President Obama attempted to instate in 2009. * These regulations stipulated, among other things, that proprietary institutions that claim to provide career training need to furnish proof that their graduates found “gainful employment,” defined in terms of a reasonable debt-to-income ratio and the ability to repay loans on time. The regulations were finally enacted—among much protest from for-profits—last year. Corinthian was discovered gaming the gainful-employment requirement by, say, hiring its students out to temp agencies for two days or counting Taco Bell as relevant employ in the field. Thus I can see why the industry fought the regulations with such vehemence. Now the Obama administration wants to add to for-profits’ tribulations by closing loopholes in the current “90/10” rule, a federal law mandating they receive no more than 90 percent of their funding from federal student aid programs. Wait, what? More than what percent of what now? You and I, my friends, are just handing cash over to the University of Phoenixes of the world, because they can’t even manage to get 10 percent of their funding from anyone but us. We might as well be saying, Hey, I trust you will use this to make yourself rich and put people from vulnerable populations in massive debt, all in the name of an education that promised to give them a shot at a better life but is 100 percent doing the opposite. To be fair, even heavily endowed nonprofit universities and colleges in the United States get a portion of their funding from Uncle Sam, but not nearly as much. For example, Ohio State (where I taught for two years) receives 18 percent of its budget from federal aid and state subsidies—the same amount it gets from tuition and fees. (Fun fact: Most of OSU’s money comes from its medical center. So that’s where that $150 emergency room copay went.) Over in the moneyed private school world, my alma mater Vassar College receives 3.4 percent of its revenue from government aid programs, 49 percent from tuition, 33 percent from investing its endowment, and 9 percent from private gifts, mostly from alumni far more successful than I, many of whom also fund private scholarships. The for-profits don’t have endowments or substantial private scholarships, mostly because their alumni are occupied with paying loans back on Taco Bell wages. But however enraged we are, what can we do? Even given the level of influence the for-profit lobby has in Washington, perhaps we can aim a little higher than just subjecting these folks to the crippling regulatory indignity that is getting a whole tenth of their money from somebody other than Jane Q. Me. Perhaps we could require new advertising regulations that put proprietary education providers in the same category as pharmaceutical companies, so that their ads would consist of 15 seconds of soaring platitudes and 45 seconds of hushed and hurried disclaimers: Suxxe$sTech Institutes may cause mild to moderate inability to transfer credits to a legitimate institution, uncontrollable head-shaking by hiring managers, and a sudden increase in negative income. The Corinthian group’s shutdown is a good start, but thousands of other unscrupulous for-profits are still peddling fake educations to vulnerable populations, and all on our dime. While members of Congress and state legislators are busy trying to police the meager food-stamp budgets of the poor, or else micromanaging the course loads, tenure, or “effectiveness” of a few hundred professors who make less money than my UPS guy, the for-profits are making billions—billions—off of loans they know will go bad. “The status quo is indefensible,” Duncan says. “The fact that so much taxpayer money is going behind this makes no sense to me.” That, good sir, would be because it makes no sense at all. Now that Corinthian has fallen into a lake of fire under the brunt of regulations that are still far too lax, will similar institutions change their recruitment practices or curricula to avoid similar fates? Or, as Duncan suggests, will nothing change until the industry is responsible for every cent its unemployable graduates borrowed, most of which went to the CEOs’ seven-figure salaries? Given the strength of the lobby, I’d say all we can do is pray.